Ashtdhatu Laxmi / Ganesha / Saraswati Coin -24K Gold Plated-250gm Dimension: .. This devotional masterpiece is the perfect choice for personal,corporate and festive gifting. On the one side, this coin has the figure of lord Ganesha & Laxmi and on the other side it has the auspicious figures of Lord Ganesha,Goddess Laxmi & Saraswati. 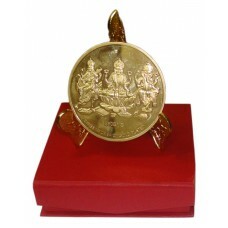 An artistic gold plated stand is provided to place it on one's office table. To keep it in one's treasure (cash box / locker etc.) is believed to bring more prosperity. 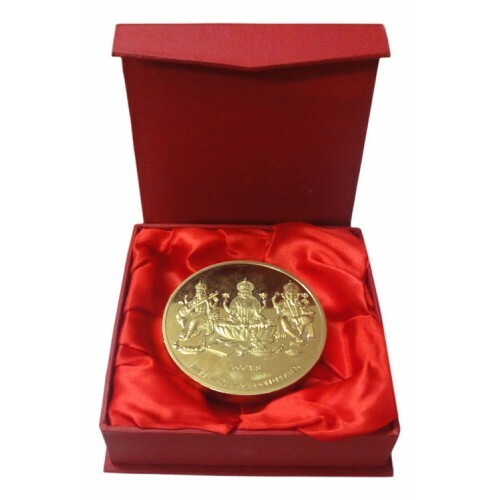 This 250gm divine coin is provided in an elegant front folded box along with the CERTIFICATE.